For the past two months I have been working on a commission costume for a friend. She is attending a “Battle of Waterloo Ball” in London to celebrate the 200th anniversary of the famous defeat of Napoleon by the English, and she needed a Regency outfit. She decided that she wouldn’t bother about a chemise, so we jumped straight into making the stays. 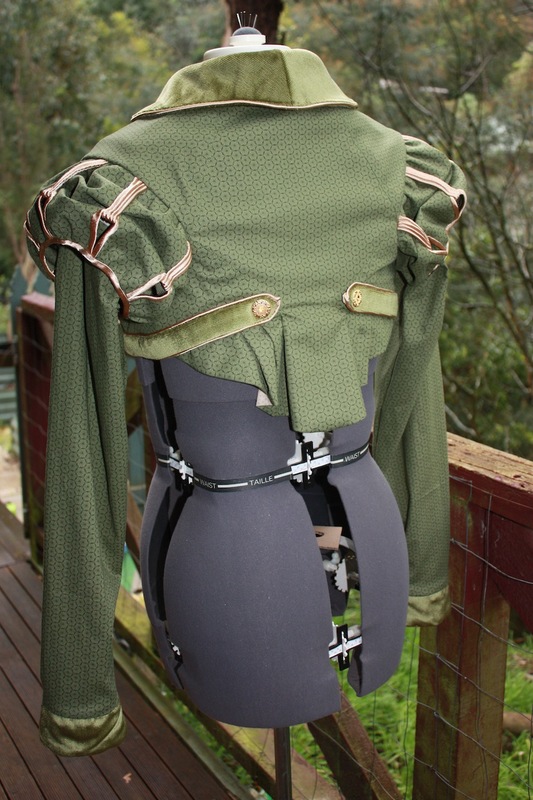 I drafted the pattern for the stays myself, using her measurements and following a similar method that I used to draft my own. The stays are made from two layers of white cotton drill, with the boning sandwiched in between. For the centre busk I used two clear 30cm rulers and the boning is plastic imitation “whalebone” boning. 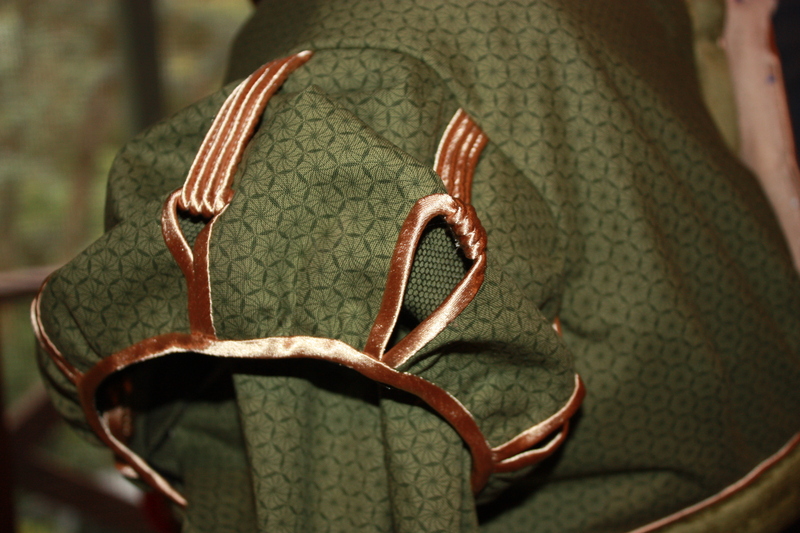 The lacing is cotton cord and I used some thin cotton tape for the front drawstring around the top of the bust. 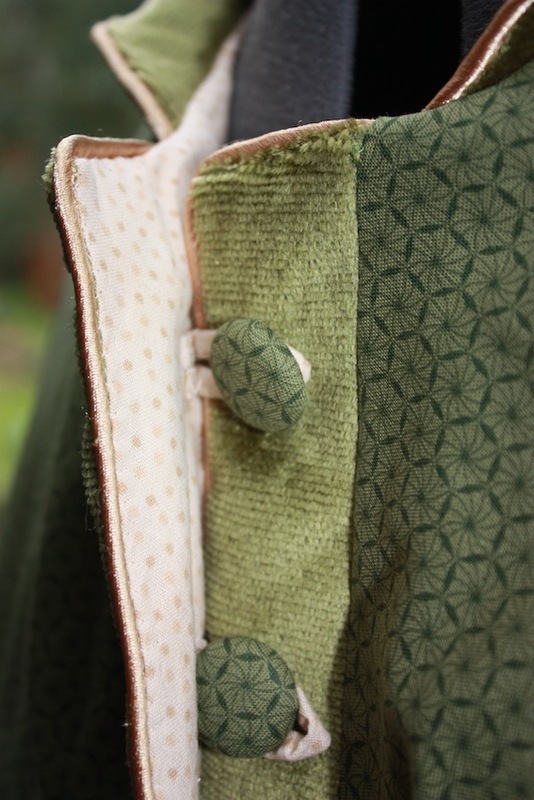 The eyelets are hand sewn using a buttonhole or blanket stitch. She was particularly concerned about her large-ish bust presenting a problem, so I used a double row of boning underneath and to the side of the bust area. The “cups” of the corset do extend a bit higher than normal to compensate for the lack of chemise. 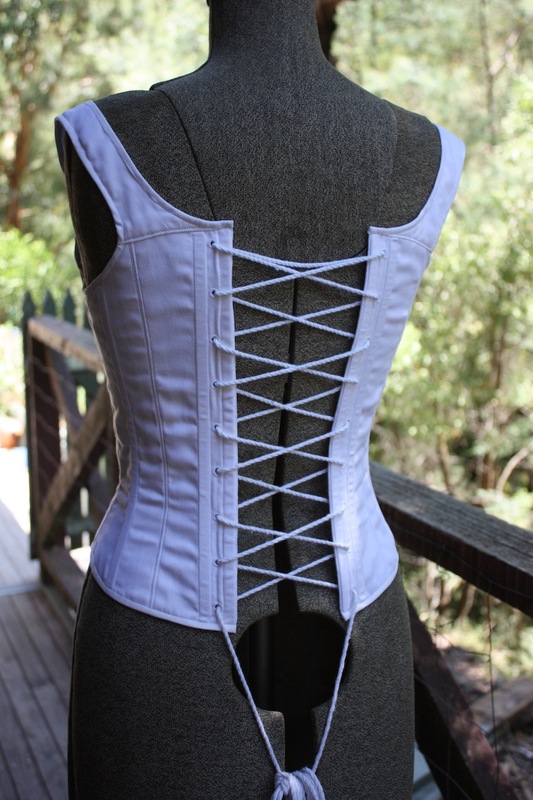 Traditionally, the corset holds the bust underneath while the chemise contains the bust from above. 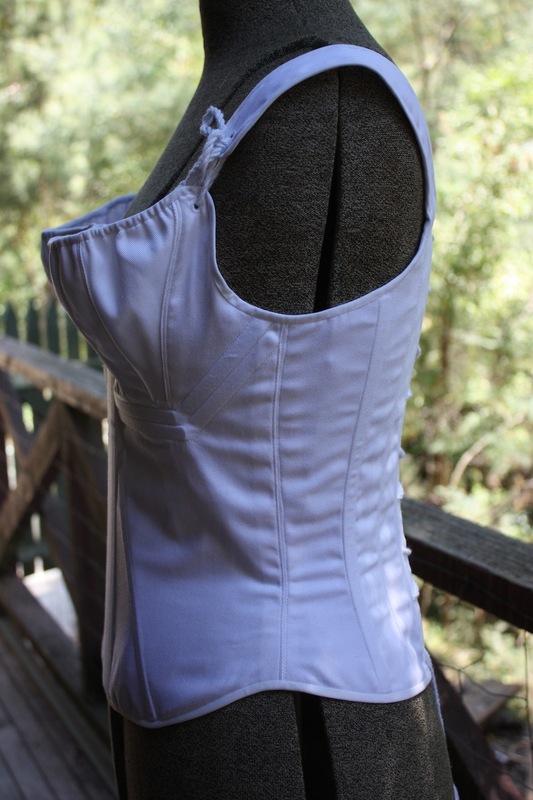 In this case, I used the bodiced petticoat to contain the top part of the bust. 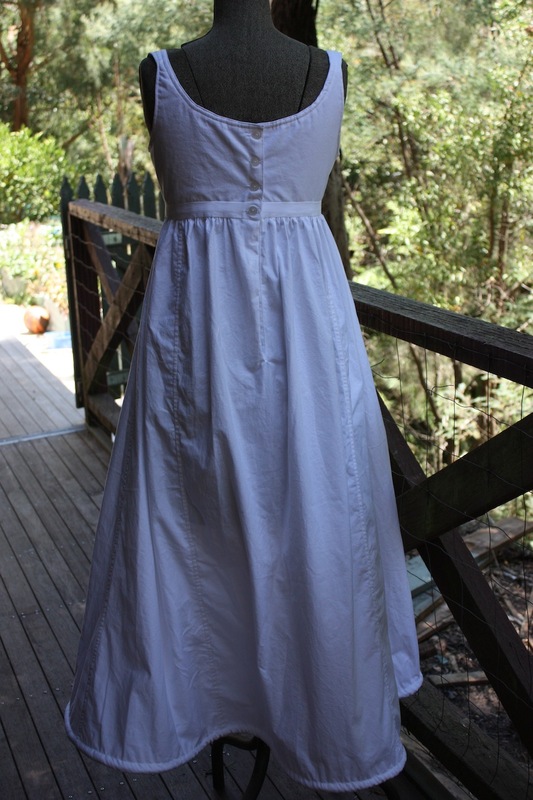 For the petticoat, we used the Regency Wardrobe Pattern by La Mode Bagatelle. I used the “DD” sizing for the bodice part but in hindsight I probably didn’t need to, as I needed to do a fair bit of adjusting because it turned out so big. 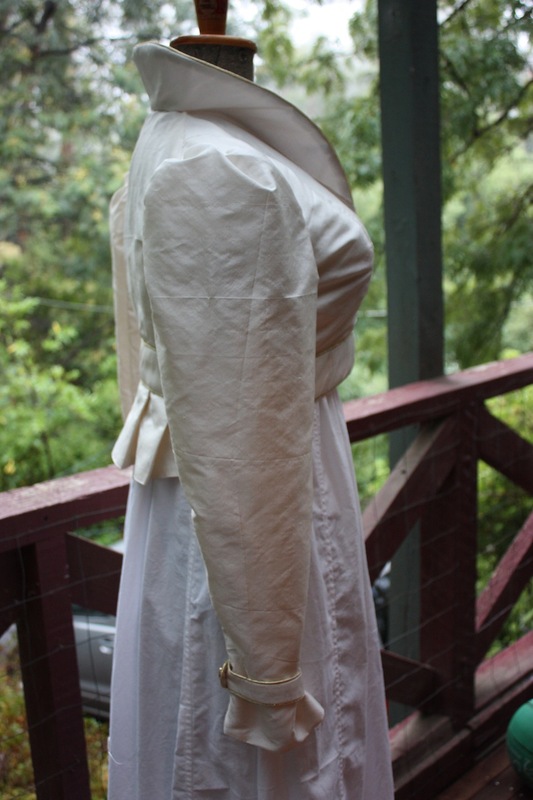 The petticoat is made from white cotton broadcloth, with cotton tape around the top edge to draw it in over the bust. The buttons are just plain modern plastic ones. 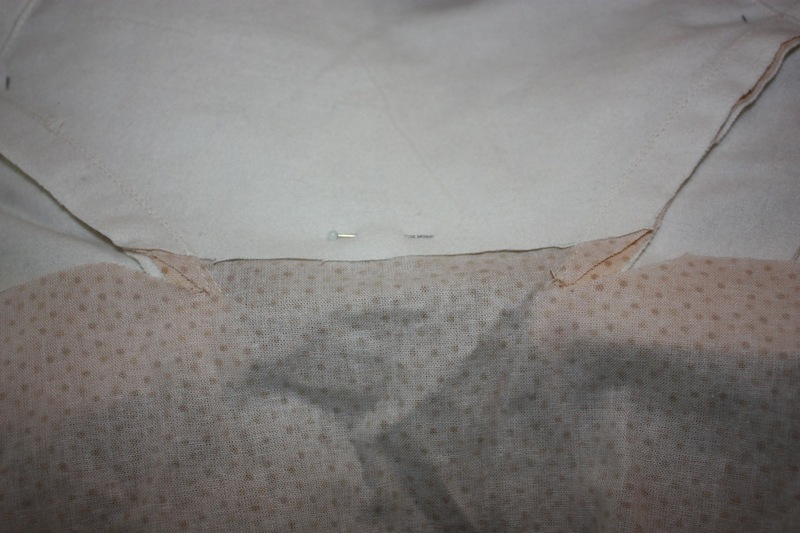 The bottom of the petticoat is hemmed with some wide bias binding, which forms a casing for some large cording. This helps the petticoat stand out from the legs and prevents the gown from clinging. 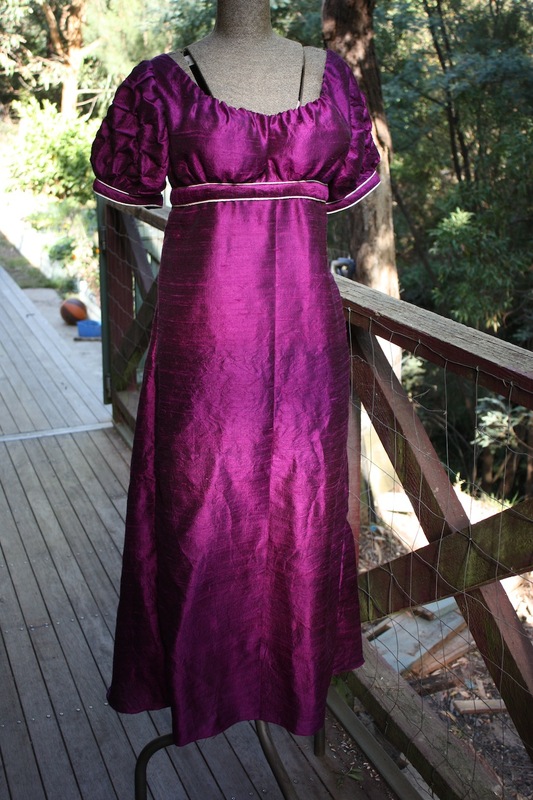 I drafted the pattern for the ballgown myself, using a lot of similar features that I used in my own purple Regency ballgown. However, I used the sleeve pattern from La Mode Bagatelle (View C – short sleeve). My friend gained a lot of inspiration for how she wanted her gown from one she saw at Edelweiss Patterns. The ballgown is made from purple dupioni silk and lined with acetate bemsilk lining. 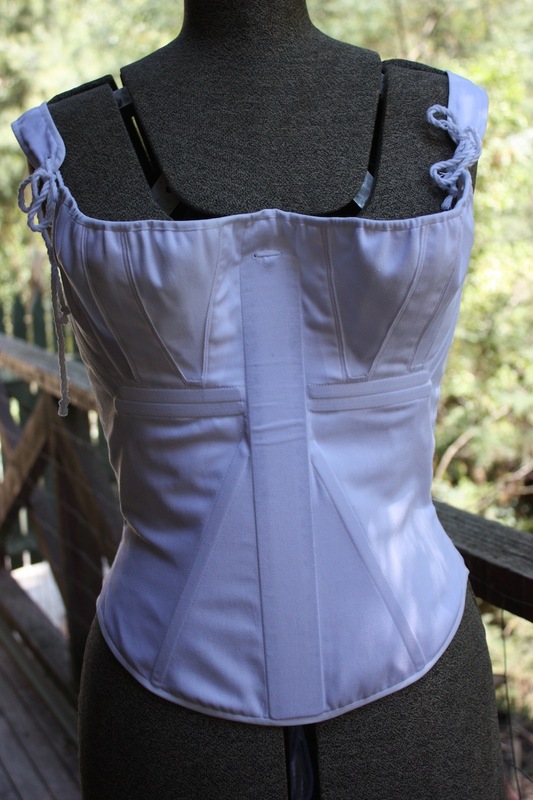 The piping around the waist and sleeves is made from cotton cord and cream satin bias binding. The buttons are self-covered and there is a ribbon drawstring around the lining of the neckline. 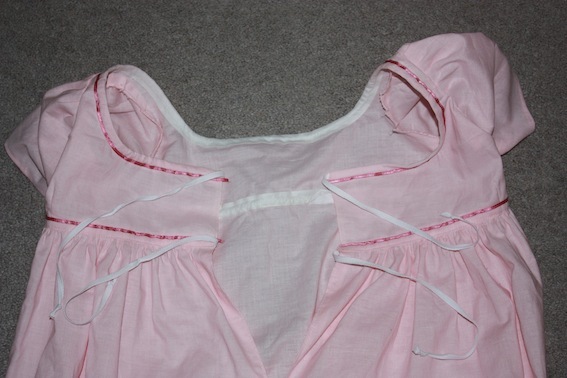 The sleeves are “smocked” by sewing thread in a 1cm diamond and then pulling and knotting the threads tight. This is repeated in a honeycombed pattern across the sleeve. This creates little “puffs” on the other side of the material (which I used as the “right” side), and my friend then sewed little pearl beads to. The hemline was embellished later with some cream lace drawn up in scallops and some “flowers” made from the same lace. In the pictures below, the dress takes on a luminescent glow from the morning sun, but the colour is actually darker purple than this. We used the La Mode Bagatelle pattern for the spencer, using View H (minus the sleeve caps and with the addition of the peplum). The spencer is made from a beautiful cream silk that my friend had in her “fabric stash”, but not dupioni as it has no slubs. The piping is made from cotton cord and gold bias binding. The buttons are a gold plastic button with a military design; a larger size for the front and two smaller ones for the cuff. Instead of boning the collar (which is instructed in the pattern), I used two layers of very stiff, woven, sew-in interfacing which has worked really well. In the pictures below, the spencer is shown over the bodiced petticoat. I am very pleased with this little project, as I don’t normally do pattern or gown drafting for other people. And my friend is also very pleased and is looking forward to her trip overseas in a few months! 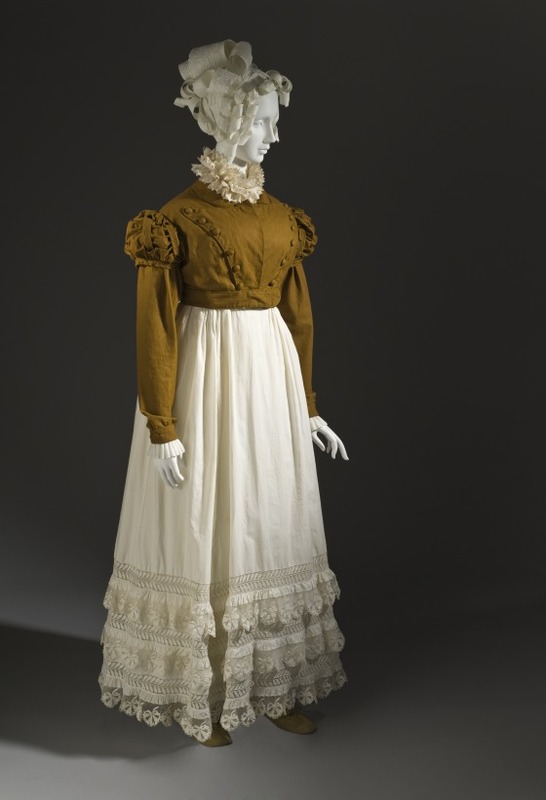 A Danish girl’s dress from the Regency era. Garment from the National Museum of Denmark. Image from the Oregon Regency Society. 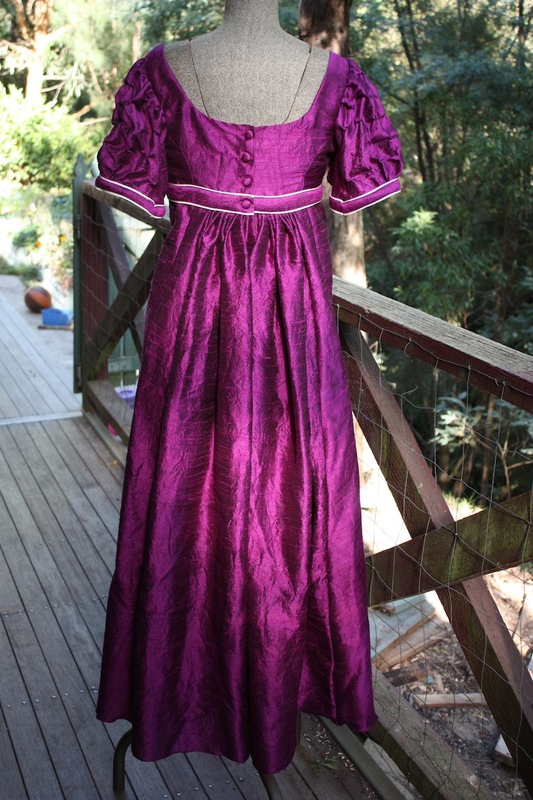 Since my oldest daughter has become interested in folk music and dancing, I have been focused on sewing her some period clothes that she can wear for dancing events. 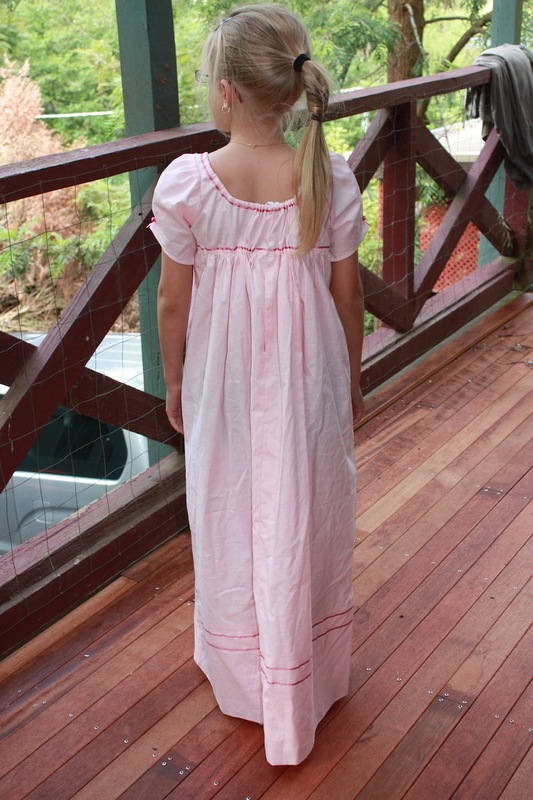 Girls dresses during the Regency era were remarkably simple in structure and make an ideal quick sewing project! 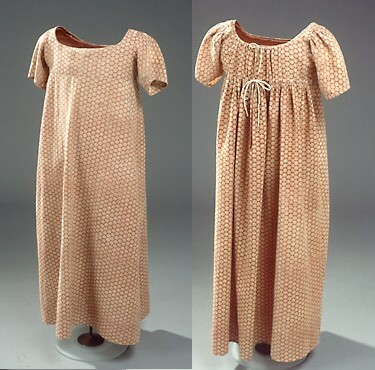 I found a picture of a basic girl’s dress when I was searching online, and there was even a pattern to go with it. The links for all the relevant webpages are provided below. 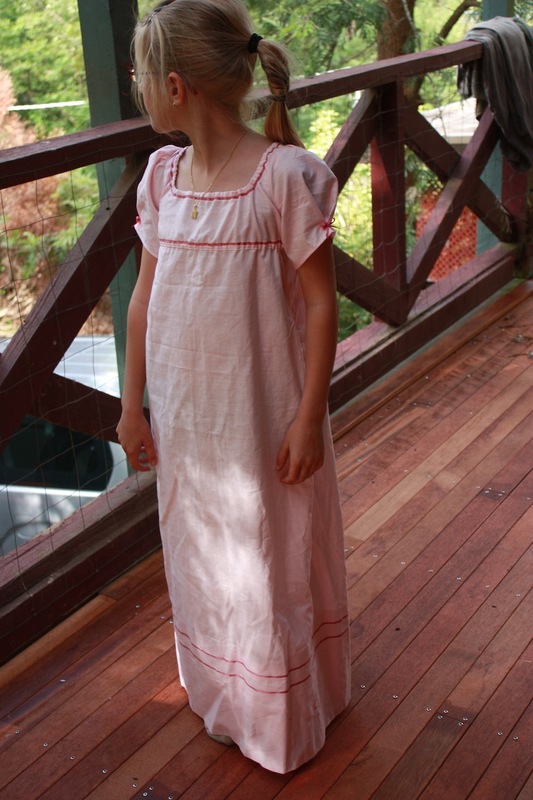 This dress is fairly standard for the era and the pattern can be fairly easily adapted for different sized children. Once the garment is made, it is even pretty easy to adjust as your child grows, which was surely as desirable to the contemporary families as it is to families today. The pattern for this dress has been provided online as an image file and can be saved to your own computer. It will need to be scaled up to full size and drawn out on some dressmaking paper. Make sure you allow extra for seam allowances. Waist measurement: remember that this should be measured at the high Regency waistline. Waist to floor: this measurement will be the length of the skirts. 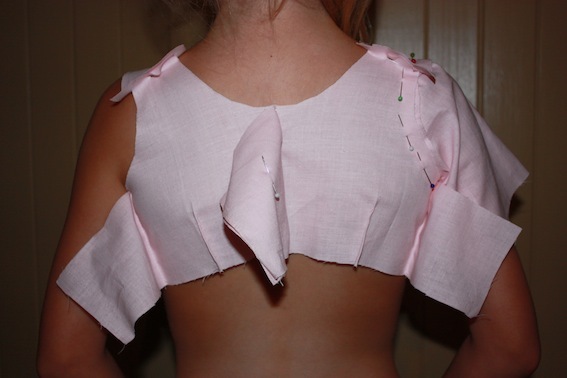 You could also take additional measurements around the chest, over the shoulder, and around the arms if desired. I didn’t, but I made sure I added extra in the seams when cutting out so that adjustments could be made once the bodice was fitted. 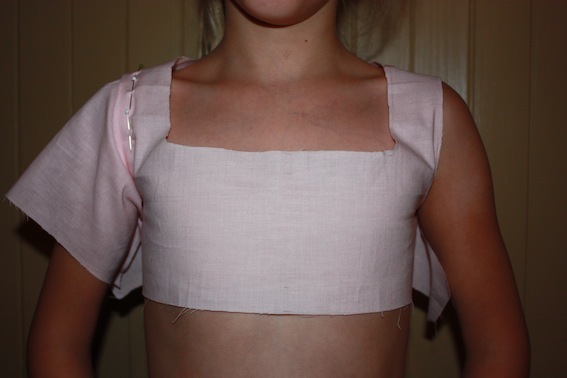 This particular pattern would probably fit a six-year-old girl, so it is possible that you may have to enlarge the bodice to adapt it for an older child, as I had to do. 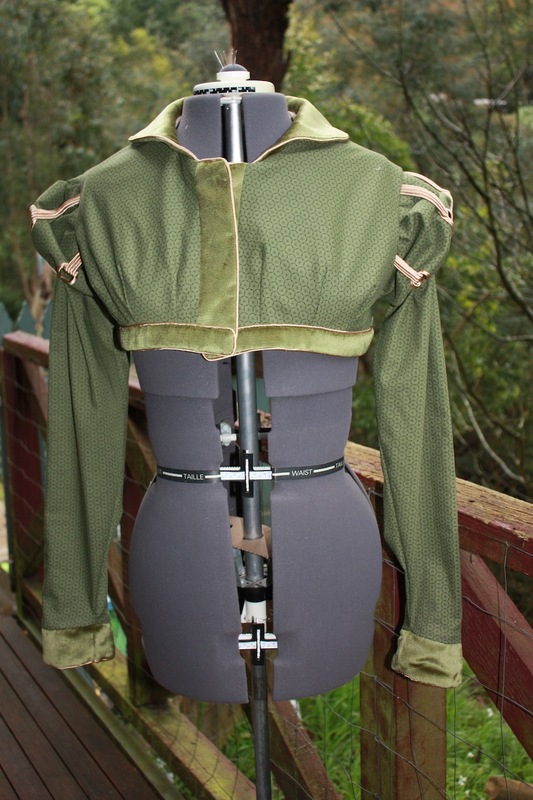 In order to do this, I made a mock up of the bodice and made several changes to the pattern. I extended the shoulder straps, I added a bit extra width in the centre front (after comparing the pattern to the “waist” measurements I had taken), and I extended the centre back to make it wider as well. I also found it useful to allow extra for the seams under the arms. Then all it takes is a quick fitting to get all the seams right. 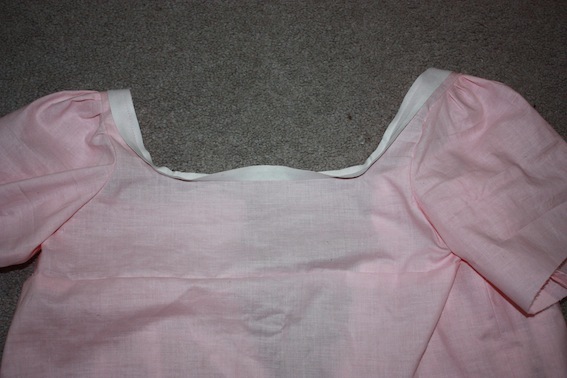 At the fitting stage, you may find the armholes and/or neckline also need trimming. Step One: Sew the side seams of the bodice together, followed by the shoulder seams. The pattern includes a very narrow piece as a side-back panel, but I omitted this piece. The back fitting: The bottom area gaped so I put in some side-back darts. I allowed extra material on the centre back seam as this extra material is drawn up with a drawstring and allows for easy adjustment as the child grows. The extra in the side seams was trimmed back. Hint: Allowing extra for a deep hem will mean that the garment can be let down as your child grows. Allow more than double (even up to triple) the waist measurement for the width of the skirts, especially if you are not using gored skirt panels. This will mean that the child will still be able to walk and run! Sew the side seams of the skirt together. Sew the centre back seam, allowing an opening of 15-20 cms at the top. I sewed a topstitch around this opening. 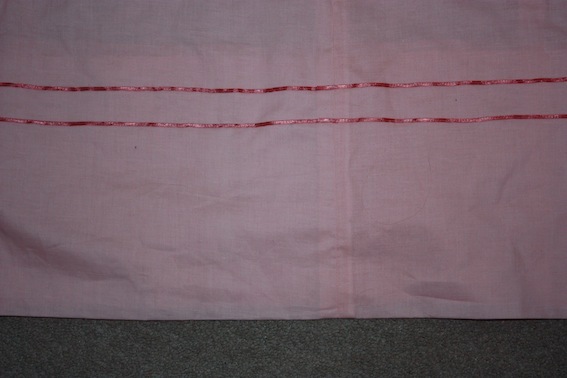 You can also hem the skirt at this point, using your measurement from the waist to the floor. Because my skirts were rectangular, it was quite easy to take up a deep hem and then hide the hemline with some rows of decorative ribbon. 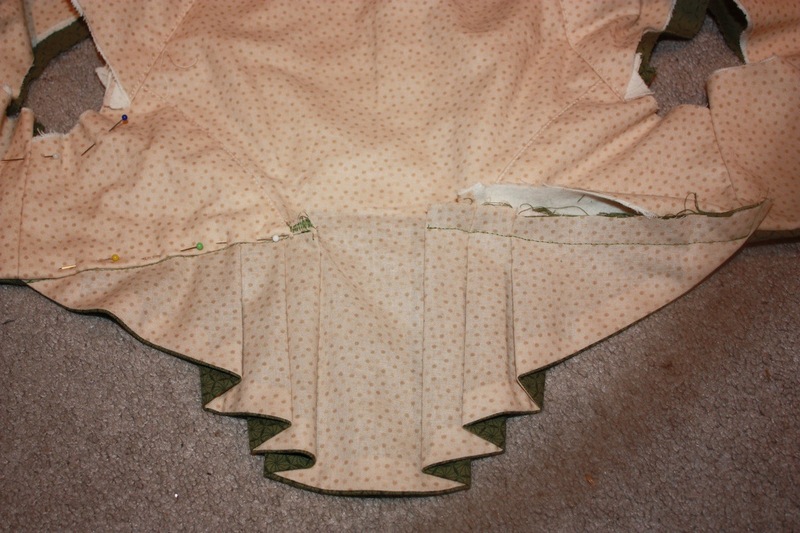 Step Three: The back panels of the skirt are then gathered and can be attached to the bodice. Remember that the back area of the dress will be further gathered up by the back drawstrings later. Step Four: The sleeve seams are sewn and I pleated (rather than gathered) the head of the sleeve to make it fit the armhole. The bottom edge of the sleeves are then hemmed. These particular sleeves are not supposed to be gathered around the bottom edge, but I decided to do a small box pleat to draw them in a bit. Step Five: The neckline of the bodice can be finished with a strip of bias binding, which acts as a casing for a drawstring. I also sewed a strip of bias binding around the waist seam as well (rather than turning the seam itself into a casing, as the pattern suggests). 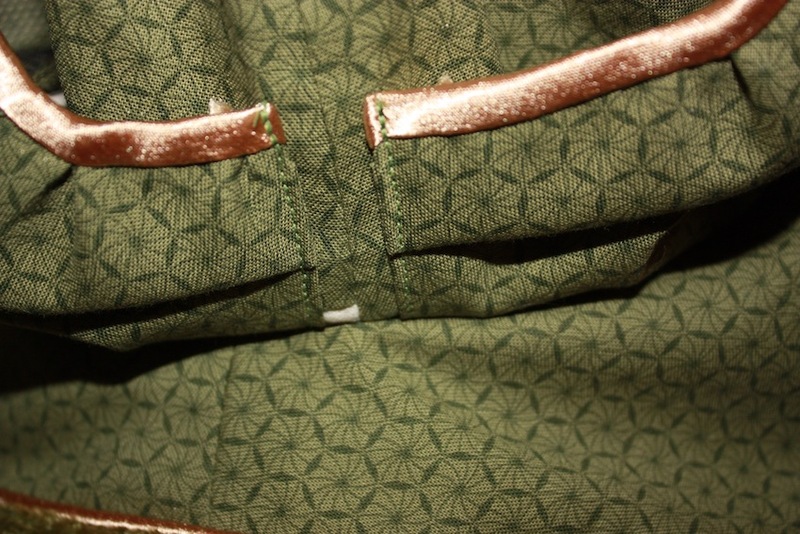 I also used some more decorative ribbon to disguise the stitching lines of the casings. 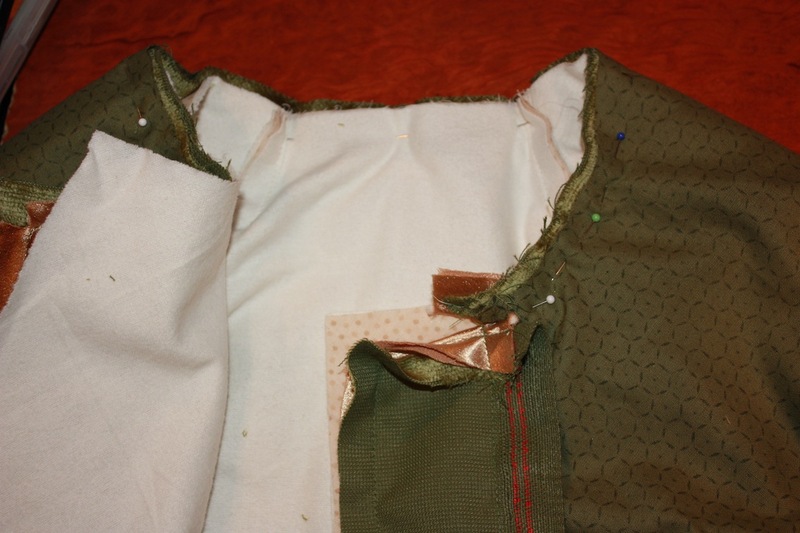 The bias binding is sewn to the neckline of the bodice. It will be turned under and sewn down to create a casing for a drawstring. Step Six: Insert cotton tape through both of the casings to form two drawstring ties at the centre back. The drawstrings have been inserted. The dress is now complete! This little daughter is keen to go dancing in her new dress. Hopefully it’s her cup of tea! National Museum of Denmark – the dress pictured is from this collection, however I have been unable to find the page for this particular dress. A Regency spencer (c. 1815), from the Los Angeles County Museum of Art (LACMA). Once you have made a supply of Regency gowns, the next thing to try making is something to keep you warm during those promenades around town. I had been wanting to try making a Regency spencer for a while and I had a small piece of velvet in my stash that I wanted to use for it. I found a pattern for a Regency pelisse (c. 1820) in Janet Arnold’s Patterns of Fashion 1, and so I decided to just use the top half and turn it into a spencer. The only significant (and tricky) alteration I made was to make a peplum for the back. Both the outer fabric and the lining are cotton, and the interlining is cotton flannel. 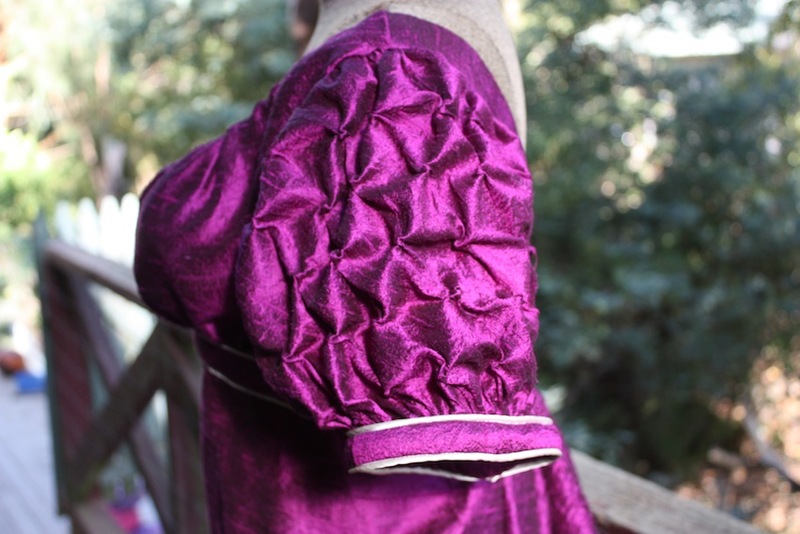 The trims are made from velvet and satin. 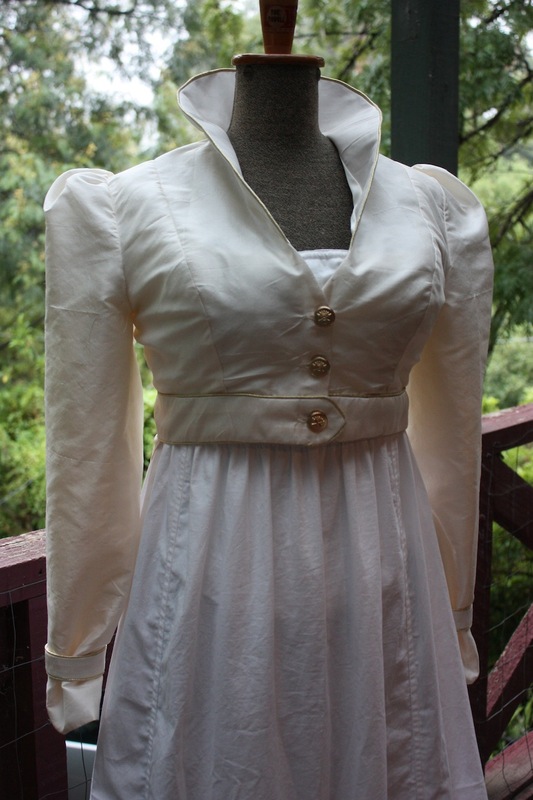 This garment fits in nicely with the Historical Sew-Fortnightly Challenge #20: Outerwear. 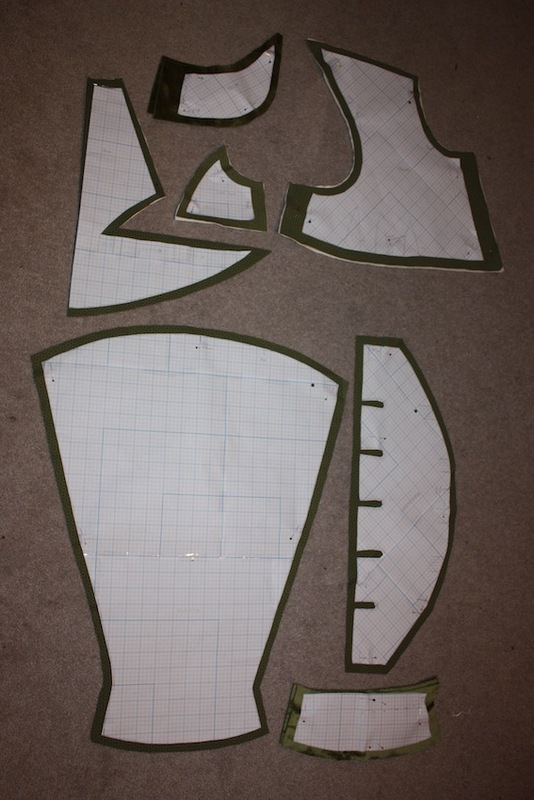 Some pattern pieces are not shown in the photo below. 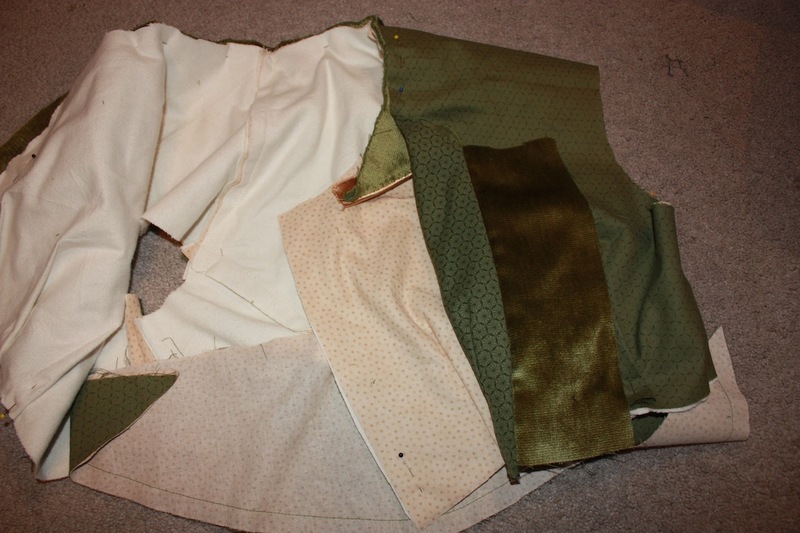 These are the sleeve head (cut from calico), and the two belts that go around the waist. Any extra “bits” are described in the steps below. Step 1: Treating the lining material and the flannel interlining as one, piece together the side seams (there are two; the side-back seam and side-front seam) and shoulder seams. Note that when sewing the side-back panel to the back panel, leave sufficient seam allowance at the bottom of the garment to attach the pleated peplum later. 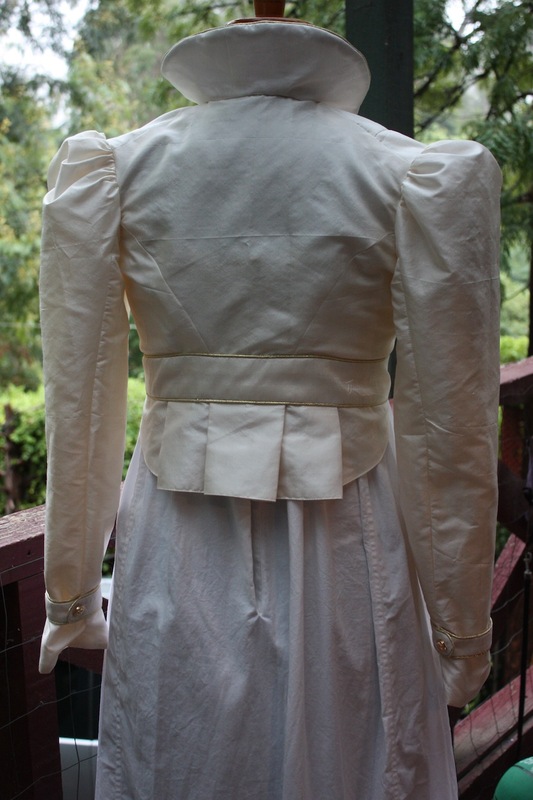 When sewing the side back panel to the back panel, it helps to draw the sewing line in tailors chalk. 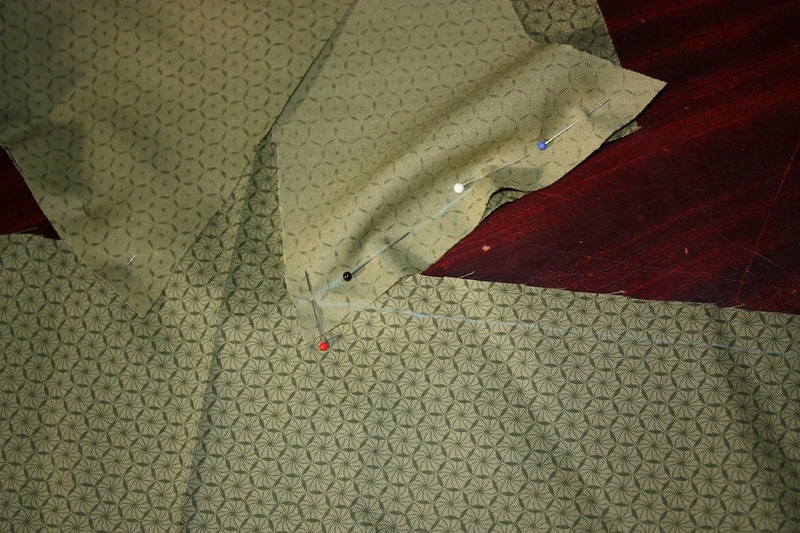 This will help to see where to stop stitching so the peplum can be stitched properly to the bottom of the garment. Press the back seam allowances to the side. Repeat for the outer material. 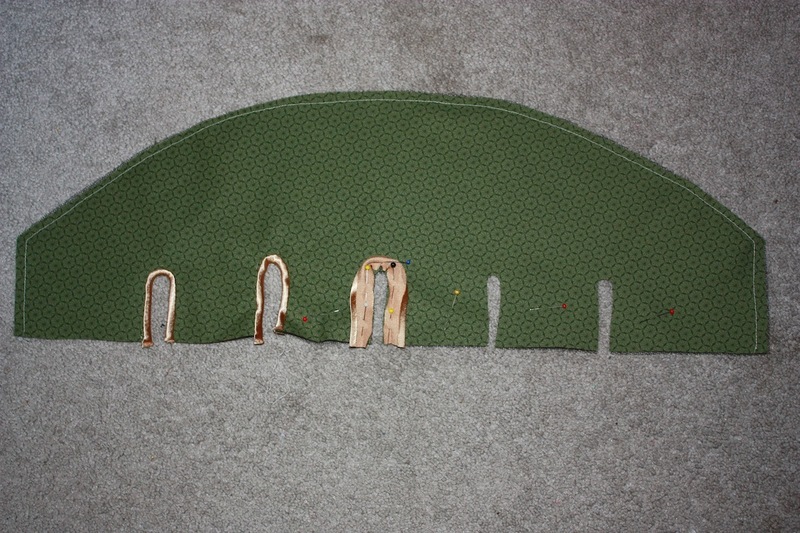 Step 2: Sew three front darts in either side of the front panel for both the lining layers and outer layer. Step 3: I made up two strips of velvet, with piping along the edges, to be sewn to each side of the centre front. However, the pattern produced by Janet Arnold is complete without it. In her example, the decorative centre front strip is mounted on top of the fabric on one side only. The centre front velvet panel is sewn in, and the lining and outer layers are arranged right sides facing. 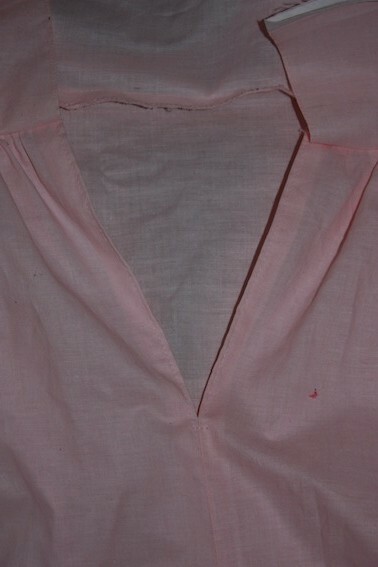 Step 4: Sew the collar seam at the centre back and then sew the two layers of collar pieces together, right sides facing. You may want to add piping along the seam, as I have. 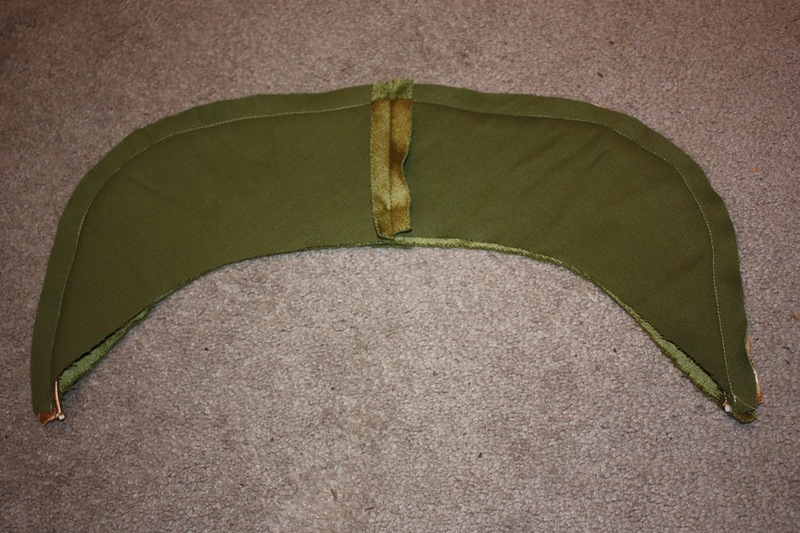 The collar is then turned right side out and sewn to the garment. Instead of attaching this collar in the normal way, I laid both layers of the collar in between the lining and outer fabrics of the spencer and sewed through all layers. This made the neck seam less bulky when using velvet. The collar is pinned ready to sew. Note how the piping from the collar and the piping from the centre front are positioned to create a continuous line. Step 5: While the outer layer and the lining layers were still inside out, I sewed around the bottom of the spencer, between the side back seam and the front, stopping where the velvet trim begins. I also sewed the bottom edge of the peplum. Then I turned the garment in the right way. Step 5: Treating the lining and outer fabric as one, pleat the peplum and attach to the bottom of the side back panel of the outer fabric, along the waistline. Clip the seam allowance to make it easier. This is the lining layers of the back of the garment. The flannelette interlining stops at the waist, so that the peplum does not have interlining. You can see the seam allowance clipped to allow the peplum to be pleated and sewn. On the right, both layers of the peplum have been sewn to the outer fabric. On the left, the peplum is sewn in and the lining pinned ready to handsew. Step 6: Attach the calico sleeve head to the top of the sleeve, and then sew side seams. 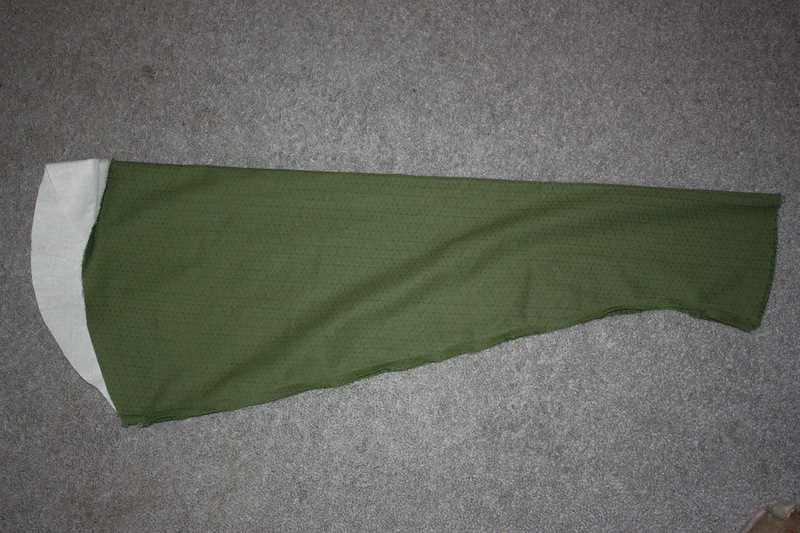 The sleeve head sewn to the sleeve. Attach the velvet cuffs. You may like to sew piping along the edges as I have done. Once again, the pattern piece is complete without the need for cuffs. 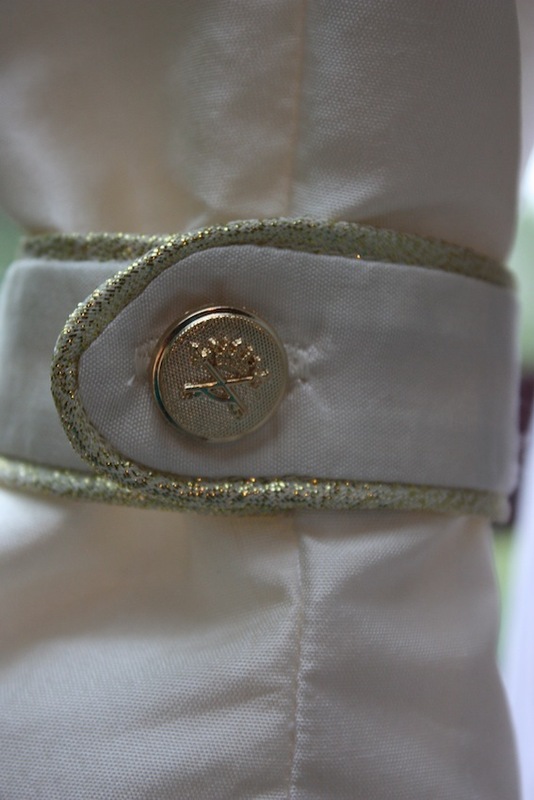 In Janet Arnold’s example the decorative edging on the cuff area was mounted on top of the fabric. Step 7: The mancherons (or upper over-sleeves) are lined with black net to stiffen them. The horseshoe-shaped areas are cut out and bound with bias binding. Binding the horseshoe cutout sections of the mancheron. Make the decorative piped band that will be used to ruche up the mancheron. You may want to experiment with different ways to do this, otherwise I have a tutorial on how I constructed mine (How to make a piped band). These should be attached to the head of the mancheron and tucked under the horseshoe cutouts to be sewn in place. Step 8: Gather the mancheron to fit the sleeve by using small tucks. Fold the side edges (underarm area) of the mancheron under and sew to the outside of the sleeve. According to Janet Arnold, this reduces the bulk of material under the arm. Then, treating the sleeve and mancheron as one, gather the sleeve head to fit the armhole (again using small tucks) and sew to the garment. Underarm view: the mancheron is also pleated under the arm to ruche it up. Step 9: Two belts should be cut to fit from the side back seam to the centre front. I attached piping around the velvet waistband and lined them using the same lining material as the garment. In the original pelisse, this belt does not appear to be attached except at the back with a button, but because this is a spencer and I did not want the waistband to sag or ride up, I handstitched it in place. Step 10: The spencer is fastened at the front with hidden loop buttonholes and covered buttons. After these were attached, I handsewed the centre front lining down. Unfortunately the centre front opens slightly, so I may attach some hooks and eyes to keep it flat. However, it is finished! This garment is fairly historically accurate as far as the pattern and look of the garment is concerned. It took many hours (probably 30 or 40) to complete, mostly because I spent a lot of time on a toile to get it to fit nicely and then again experimenting with the trim. Having a baby in the middle of the project didn’t help either! 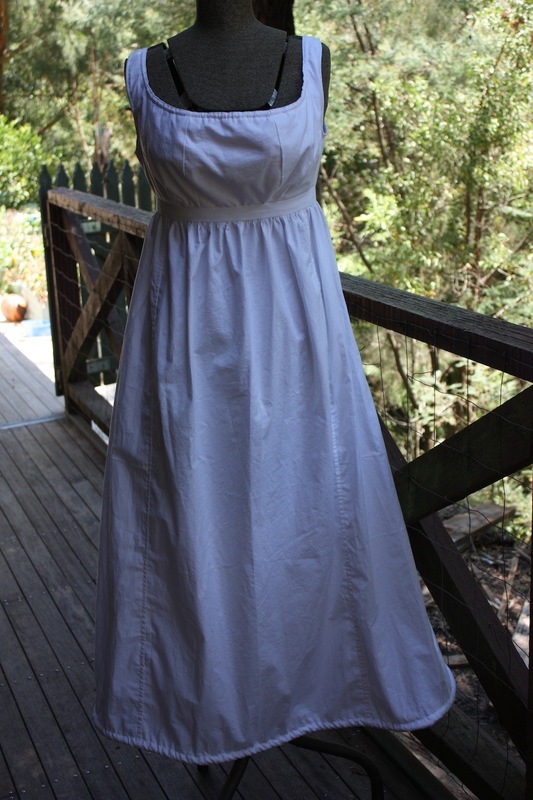 The total cost of the project was about $40 AUD, and I am hoping to wear this garment for next years Jane Austen Festival in Australia.